A good detergent must have a great number of features. First of all, it must be able to wash away a wide variety of different types of dirt from many various types of textiles without causing any damage. In addition, it must work under varied conditions, in different types of washing machines, when washing by hand, at different temperatures, and in both hard and soft water. Finally, the washed textile must not only be clean, it should also look and feel clean. It should be soft, not have any unpleasant odour, white should be white and the colours should be clear and pure. GNLD’s G1 was formulated for this purpose with all these challanges in mind. Scientists have long known that soil and dirt are difficult to remove from laundry. Dirt molecules seem to have an affinity for fabrics, clinging to them, resisting attempts to dislodge them. G1 overcomes the problem. The effective ingredient in G1 penetrates into the most difficult dirt imaginable and “lifts” the dirt out of the textile that is being washed. Mild alka-lines attack the dirt. Once the dirt has been removed, measures must be taken to prevent it from getting in touch with other garments that are being washed. 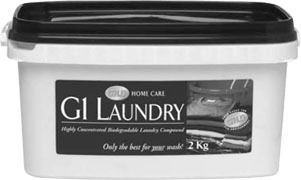 G1 contains ingredients which keep the dirt in the washing water until it has been rinsed away. Furthermore, G1 also contains substances which counteract corrosion of metal parts in washing machines. G1 contains sodium perborate which is very effective in removing difficult stains and it also works at low temperatures thanks to another special component. Together with the optical brightening agents, these two latter components also make the white laundry whiter and the colours of the coloured garments brighter. It does not accumulate in the fibres and there is no risk of yellowing with repeated use. Dosage depends entirely on the degree of soiling and the size of the wash load. Heavily soiled washing generally requires higher dosage levels. Because of the effectiveness of G1, most washing can be done at 40ºC. For more soiled wash GNLD’s Oxygen Bleach can be added. The addition of GNLD’s Oxygen Bleach requires the water temperature to be increased to 60ºC. A scoop is available from your D.C.